In today’s uncertain world, most building owners and managers have conducted threat assessments and created the requisite security plan to combat the perceived threat. Threats come in many shapes and sizes. Natural threats, such as hurricanes, earthquakes, and other weather-related disasters are no more or less serious than human threats such as active shooters or terrorists. Typically, a building’s security plan is designed to protect people, property, and the continuity of operations. Deterring Unwanted Entry. One of the fastest ways for an intruder to gain entry into a building is through the window. Whether prying the lock or breaking the glass, a building’s window is a weak point. Security window film helps prevent unwanted entry by increasing the time necessary for an assailant to enter. Adding shatter-resistance can make penetrating a glass opening more difficult. Since intruders rely on quick and easy access for a successful break-in, a door or window that slows them down is one that will probably make them go away. Bomb Blasts. When an explosion occurs, nearby glass may be broken into tiny sharp fragments and subject building occupants to a high level of danger. As a cost-effective alternative to blast-resistant glass, security film acts as a protective membrane to hold these tiny fragments in place, thereby increasing the safety of those inside. Security film was credited with saving many lives in the September 2001 terrorist attack on the Pentagon. Attachment Systems. 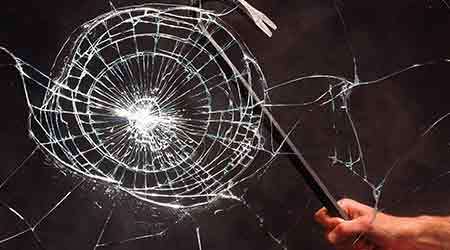 Security films help to hold broken glass in place but do nothing to address another potential vulnerability — that the glass’ new weak point is now its edge along the perimeter gasket. For example, while the glass pane might be held together by the safety film, it could still be forced out of its frame by a bomb blast or intruder with a crowbar. Consideration was given to this fact and attachment systems were introduced to bond the film to the glass to the frame. Building owners and property managers should consider the safety of their tenants by taking protective measures to fortify their buildings. Because glass is often a vulnerability to any building, security film is a cost effective retrofit to protect people, property, and the continuity of operations. Manny Hondroulis is vice president at Energy Products Distribution.